Employing the latest manufacturing techniques, within temperature controlled facilities, delivers a truly innovative product. With a proven pedigree in application placement, the Rollvis Satellite roller screw program offers a unique precision linear device, that accurately transforms rotary movement into a linear motion. Utilising, internally captivated threaded rollers that sit between the screw and the nut dramatically increases the high number of points of contact with the bearing system. This mechanical advantage enables satellite roller screws to support very heavy loads with precise and reliable motion. Meticulous attention to detail during manufacture ,backed up with honed experience, delivers a formidable linear package. There are many ways of transferring a rotational force into a linear one, particularly in the world of linear translation devices. Such devices include the simple lead screw and plastic nut and the industrial standard recirculating ball screw device. Each design discipline has advantages and disadvantages over the other but equally each have a legitimate place in the linear market. 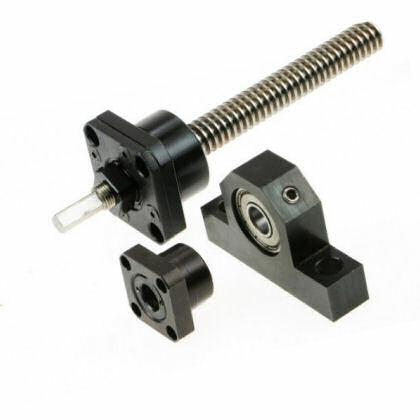 An often misunderstood linear device however is the satellite roller screw, and it is worth some extra attention due to the nature of its function and capability. With a traditional recirculating ball screw design, the captivated ball bearings within the nut housing transfer the load (force) between the screw and nut. This ordinarily means that in order to increase the load capacity, but remain with the same sized screw; you have to change the ball nuts physical parameters. Firstly, an increase in the amount of ball bearings physically touching the load surface of screw and nut within the nut housing will increase its load capacity. This can be done by increasing the amount of times the ball bearings recirculate within the ball nut housing, but the playoff of this change normally means a larger diameter nut housing or a longer nut housing. To this effect, the ball nut size versus its load capacity will always be apposing each other. It is true to say that all these options ultimately increase the load capacity, but in every case there is still a limitation of the actual load bearing surface area per ball bearing. This is where the satellite roller screw has a large advantage, which ultimately translates into a high load transfer capability. A satellite roller screw employs matched rollers to rotate (or satellite as the product name suggests) around the screw thread during actuation instead of ball bearings. By design, there is an immediate increase in the physical amount of contact points on the screw that can support a load compared with that of the same diameter ball screw. The satellite roller screw is therefore primarily chosen as part of a transition within a new or existing design to achieve greater load capacity and greater linear positional accuracy, in the smallest envelope space. The admissible static and dynamic load capacities are therefore considerably higher than that of ball screw for the same diameter. In fact the static load can be 3 times greater than that of ball screws and as a consequence, their lifespan can be up to 15 times longer. The many points of contact also give a satellite roller screw greater rigidity and shock tolerance than a ball screw without a compromise to friction or efficiency. 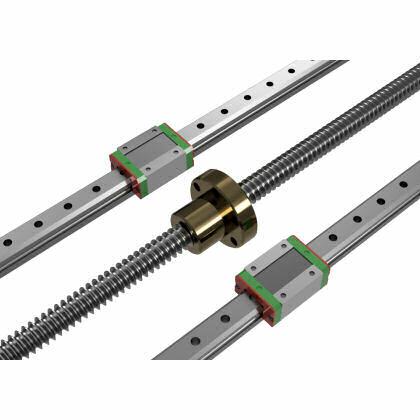 Satellite roller screws are precision linear devices, that accurately transform rotary movement into a linear movement. The first patent for a roller screw was recorded in 1949 by the inventor Mr Bruno Standgren, an adaptation of a friction less bearing design patented back in 1939 by Mr Oscar and Stewart McCurdy. In essence the idea was to convert the rotation of a threaded bar into an accurate linear motion via a series of timed and captivated roller bearings within a nut housing. The roller bearings would rotate or satellite around the diameter of the screw giving rise to the full name of the product; the satellite roller screw. The rigid design allows for a small overall diameter of nut but have the ability to deliver massive load capacity due to the many contact points between rollers and screw. Having a bearing heritage means that the whole assemble can be up to 97% efficient and can have an expected life up to 15 times longer than any ball screw equivalent. The design accepts high acceleration and deceleration and is capable of rotating in excess of 5000 rpm, making the roller screw product a superior linear drive alternative. A roller screw design will always transmit more load than a ball screw nut assembly size for size. These are some of the questions being asked by design engineers or maintenance engineers when coming to ABSSAC in search of linear technical assistance. "I need more performance from my ball screw." "My hydraulic linear actuation system is a major part of my maintenance schedule"
"My ball screw is failing prematurely due to high duty cycle". "I have reached the boundary of performance from my existing ball screw but have no way of increasing its dimensions within the current design"
What we believe to be the smallest satellite roller screw in the world has been supplied for a medical application. The satellite roller screw type RV 3.5 x 1 mm (diameter of the screw 3.5 mm, lead 1 mm) provides a repeatability of 1 micron. Amazingly the new miniature assembly has the capacity to move over 20'000 times its own weight. A great example of a high load application successfully mastered by the satellite roller screw was recently exemplified when a standard RV style screw replaced a hydraulic cylinder within an injection moulding machine. Traditionally, hydraulic cylinders initiate the pressure control required within injection moulding machines to ensure mould integrity. Pneumatic systems cannot produce the necessary forces, and traditional ball screw designs would have to be over-sized to achieve similar forces reliably. During injection moulding, plastic material is heated until molten. A motorised auger screw forces the molten material to the end of the injection cylinder. 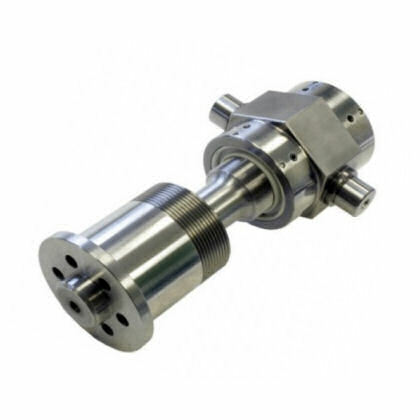 Once enough material has accumulated in front of the screw, the injection process begins with injection pressure provided by hydraulic actuation. However, using hydraulics inevitably requires the use of hydraulic pumps, pipes, seals and control units within the machine, all of which can be bulky in design and expensive to maintain. The satellite roller screw product delivered the same linear forces necessary for injection, but also has the advantage of being coupled to less expensive and infinitely more adjustable closed loop electric motor drive design. The same program can now deliver a differential nut and screw set up (RVD). Based on a variant of the RV and BRV screws, its components are used to produce extremely fine lead of threads or even a zero lead. The movement of the rollers in this somewhat complex mechanism does however prevent a wide range of travel, but does achieve a predicted and highly accurate function of proceeding at a different rate to the input rotation. Please note that to achieve this differential result, the nuts are larger than on the RV and BRV types. After its founding in 1970, ROLLVIS SA soon began to focus on the manufacture and marketing of satellite roller screws under the trademark. Now a benchmark in this highly specialized field, ROLLVIS SA has invested in the most powerful machines for the production of screws with low tolerance margins designed to individual specifications. A fast-growing company with a young and highly qualified workforce, ROLLVIS SA recently moved into new ultra-modern premises near to Geneva. It is structured to preserve its human scale and its capacity to listen and adapt perfectly to its customers’ requirements. Four decades and more of skills and experience combined with the latest high-end techniques ensure its products comply with the most stringent and demanding standards. Satellite roller screws are particularly suitable for applications where high axial loads, high speed, and high feed speeds are requested. Other applications to date have included flight critical aerospace apparatus, medical operating equipment and advanced machine tool operations. As standard, satellite screws can be supplied with outside diameters as small as 10mm and up to 200mm. Leads can be as fine as 0.25mm. The product can be finitely accurate and capable of being adapted into very specialist and demanding linear applications. The main elements of RV and BRV satellite roller screws are the screw, the nut and satellite rollers and primarily have multiple-start thread formats. The angle between the flanks is 90° and the profile is triangular. The nut has an internal thread identical to that of the screw. The rollers have a single-start thread with an angle the same as that of the nut. 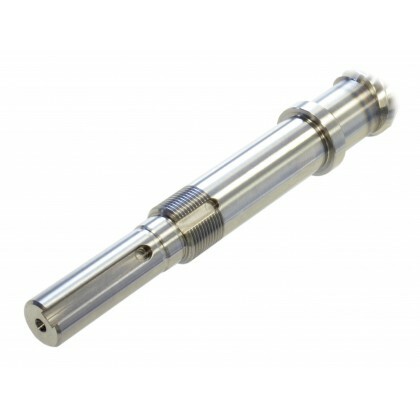 This ensures there is no axial movement between the nut and the rollers. The rollers do not therefore need to be recycled. The flanks of the roller thread are convex. At each end of the rollers there is a cylindrical pivot and gear teeth. The pivots are mounted in the holes of the end rings, thus ensuring the rollers are equidistant. The end rings are floated in the nut body and axially secured with circlips. The gear teeth engage in gear wheels fixed in the nut. This guides the rollers parallel to the axis to ensure perfect functioning. The RVD series is a variant of the RV and BRV screws. Using similar components, the ratios between nut rollers and screw thread are expertly calculated and adjusted, to deliver extremely fine threads or even zero. Due to the complexity of the design, the nuts are larger than on the RV and BRV types. Also available within this series is the Planetary roller screws system, with smaller leads compared to ball screws. As the lead is a function of the pitch of the planetary roller screw, the lead can be very small (0.5mm and even less). The lead can be chosen and supplied without any geometrical changes of both the screw shaft and the nut body. In a ball screw the lead is limited by the dimension (Outside Diameter) of the bearing ball, which is a standard feature. The RVR satellite roller screws is designed for very fine threads and leads and are used where a high positioning precision is required in association with high stiffness and heavier axial loads. As the rollers are recycled after each of their revolutions, this design is not suitable for high speeds. The main elements of RVR satellite roller screws are the screw, the nut and the rollers which are guided and maintained at the correct distance in a cage. The screw has a single or two start thread with a triangular profile. The angle between the flanks is 90°. The nut has the same internal thread as the screw. The rollers are not threaded but have grooves perpendicular to the screw axis. The distance between the grooves matches the exposed thread of the screw and nut. The flanks are convex and the angle between them is 90°. When the screw or nut rotates, the rollers are axially displaced in the nut. After a complete revolution, each roller is returned to its initial position by two cams at the end of each nut. They can be recycled this way because there is a groove the length of the nut. The cage pockets are slightly longer than the rollers to enable them to move axially within the nut. RVI satellite roller screws work on the same principle as RV and BRV screws except their nut system is reversed. This means the rollers themselves rotate around the screw (instead of the nut in RV and BRV screws) and move axially within the nut. Apart from the screw threading where the rollers orbit, the journal is smooth and can have a special shape (e.g. : anti rotation). The nut is threaded along its entire length and is much longer than on RV and BRV screws.